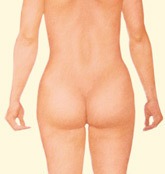 Liposuction, also called lipoplasty, is a procedure that removes excess fat deposits with the use of suction cannulas. 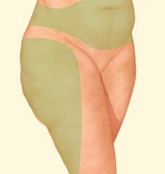 Liposuction slims and reshapes targeted areas of the body, improving the body contours and proportions. Liposuction surgery has been used to improve many areas of the body with stubborn fat pockets including the thighs, arms, neck, hips, waist, back, inner knee, chest, cheeks, chin, and calves. Liposuction can be performed alone for a targeted area or can be done in conjunction with other plastic surgery procedures such as a facelift, breast reduction, or a tummy tuck. Why do people choose liposuction? Many people in good health and a reasonable level of fitness may still have localized fat deposits that leave the body with disproportionate contours despite all their efforts to lose the fat. These areas may be due to family traits rather than a lack of weight control or fitness. 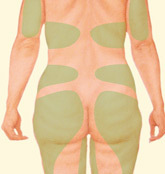 For many people, diet and exercise alone are often not enough to remove excess fatty tissue in problem areas. Liposuction is one of the best and most effective means to safely remove unwanted fat. According to the statistics from the American Society for Aesthetic Plastic Surgery, over 340,000 patients chose liposuction in 2008 by plastic surgeons alone. Liposuction involves the injection of tumescent solution that will provide pain and blood loss control into the problematic areas of your body. Small tubes called “cannulae” that are attached to a suction machine are then subsequently inserted into tiny incisions that are inconspicuous and easily hidden. These cannulae are then used to suction unwanted fatty tissue and remove it from beneath the skin. Although the procedure is done by many surgeons that were never trained appropriately, ensuring that you are left with a smooth and attractive result is extremely difficult and only done well by a well trained plastic surgeon such as Dr. Armenta. While liposuction is not a treatment for obesity or a replacement for regular exercise or good eating habits, liposuction can change your body to reflect your healthy lifestyle and improve your self-image and your self-esteem. This help in getting rid of stubborn fat deposits that don’t respond to diet or exercise can motivate you to maintain your physical fitness. How can I find out if liposuction is right for me? If you’d like to make an appointment for a consultation to learn whether or liposuction is right for you, contact Dr. Art Armenta’s office. Dr. Art Armenta is a Diplomat and is certified by the American Board of Plastic Surgery and is a member of the American Society of Plastic Surgeons.